This photograph was taken one year before the property was purchased back by its former owners from the nearby amusement park. While the motel and restaurant are long gone, the ice cream stand has reopened and is going strong. 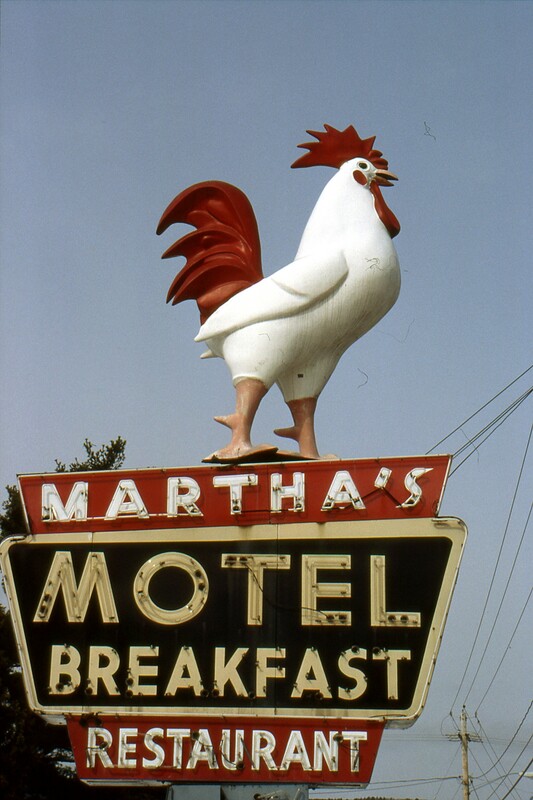 Charlie the Rooster lives on although the lower part of the sign has now bee re-purposed in proper, glorious neon for Martha’s Dandee Cream. Even if not planning to visit the Lake George area along U.S. Route 9, reading the story on the website of this property’s history is a wonderful tale of a family not just bringing back old memories but also planning on creating new ones for generations to come. Posted in Food, Retro/Vintage, signTagged Americana, chicken, Lake George, neon, restaurant, Route 9Bookmark the permalink.